My friend Liz took me out for lunch today to celebrate my birthday. We headed to a small, cozy restaurant in North Delta called "Applewoods". We had a lovely lunch, followed by the best Strawberry Rhubarb pie I've every eaten!! Applewoods serves lunch and high tea and their baked goods are awesome!! After Liz dropped me back at home, I headed into the studio. I had an idea in my head for today's sketch challenge and wanted to make it with the clean & simple challenge colors from Monday (Red, Black & White). I printed the grand piano image on my computer to use as the main image. Hope you like. I made my own wheel guide by adding lots of pop-ups from the $1 store to the underside of a 12" ruler - it works really well!! 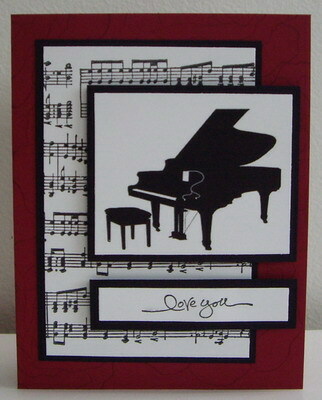 I used the wheel guide to stamp the musical notes four times across the background strip. I stamped the rose from the Fifth Avenue Floral set in Versamark all over the card base of Cherry Cobbler (hard to tell in the photo - it's very subtle). I framed all the pieces of the card with Basic Black cardstock and mounted them as per the picture above, popping up the main image and sentiment with dimensionals. This was a quick and easy card.